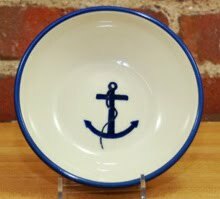 Nautical by Nature: Hartstone Anchor Dinnerware & Gifts 50% off! 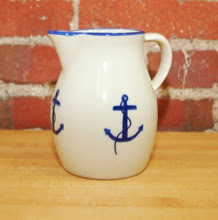 Hartstone Pottery is handcrafted and hand-painted in Ohio. 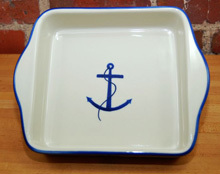 Dishes are microwave, freezer, oven and dishwasher safe. How fun--I need a baker. Thanks for sharing the code. these I love, absolutely darling Miss Kate! 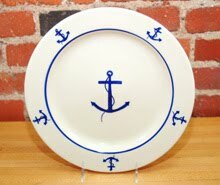 I would love a table set with those plates. My sons room is nautical! 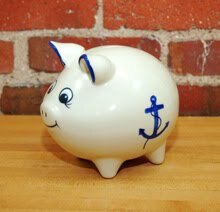 Love the piggie bank!! Cute plates! To answer your question about the letters, yes they usually vary from store to store. Maybe try Michael's if y'all have one? Or an art supply store!